It's funny how twenty-four hours can change everything. On Sunday afternoon I was reading Bill Simmons' latest mailbag and in one of his dissections of a reader comment, he made the remark about how far Peyton Manning of 2010 had come from Peyton Manning circa 2003-2004. The new Peyton Manning was clutch, a guy you would never bet against with two minutes left in a game. The 2010 Peyton Manning was the ultimate quarterback. His coach, Jim Caldwell was a limp replacement for Tony Dungy, a figurehead who knew that Peyton was really coaching the offense. 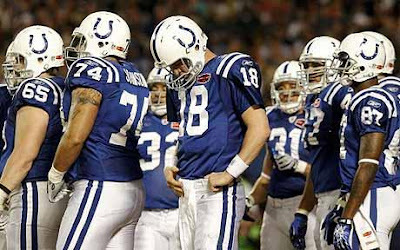 And as the Colts headed into Miami and their Super Bowl against the Saints, you had to believe that this was Peyton Manning's time to place himself into history. He'd already banished the demons of the Patriots and the label of "never won the big one" back in 2006. And each year he'd steadily rewritten his own on the field failures. So, now at the dawn of a new decade, with one of the symbols of the past 20 years of the NFL almost certainly fading away (Brett Farve) it seemed like Manning was about to take the great stone ledger and etch his name into it. What filled in the void created by the thrust of Peyton's action? It was the story of Drew Brees as a great guy, as perhaps the best quarterback in the game over the past two years. It was the images of Drew Brees holding his son as the confetti fell around them, Drew lightly crying while his son wore headphones and drooled slightly. It was a tender moment, that proved the advertising mind behind the Google advertistment during the game true. That damn Google commercial that showed time passing through the words the search box only to end with the search for the question, "how to assemble a crib?" It was the best passing of time sequence since UP. But that's what this Super Bowl did. It gave the world a chance to glimpse true success: achievement at your job, achievement in your community, achivement in the pronlonging of human life. In some strange way, the Saints win put Drew Brees on display and without knowing it, with a smirk like Tom Brady or a frown of determination like Peyton Manning, he showed us the allures of succes, of working hard, of enjoying what you do and in the end, just enjoying what life can give you. He meant none of this obviously, it was just images on a screen and a belly full of beer. Now, I don't want to be hard on Peyton. I truly think he has become an impeccable athlete. I love his current public persona as well. I think he is an amazing competitor and I've never seen a football player like him, much less a quarterback. And there is something fascinating in the way he has always flirted with perfection and the journey of becoming an historical figure. However, maybe the allure of seeing Peyton succeed and become fixed and static with achievement isn't what we want. Maybe we need to see him fail only to have him pull himself together again to show his resiliency and his form. What gets me, is that out of the two postures in the pictures above I don't know which is more intriguing. One is obviously the posture of defeat and the other of victory. However, Peyton Manning is by no means a loser, but there is something about his posture that makes me think of a song with slow piano, like "Congratulations" by Paul Simon or (and maybe I have been watching too much of Ricky Gervais' Extras) "Tea for the Tillerman" by Cat Stevens. The confetti of the celebration falls around the form of Peyton Manning and he realizes that he's tired and there's something else out there, that no matter how much success he has there will never be enough for him or anybody else that follows him and wishes him well. And maybe, just maybe he has to walk away, let that weary piano dictate his soul to the next destination. Would Peyton ever do that? No, of course not. Does it seem like a good story or even a cliche? Sure does. Does it seemed like misplaced thinking for my own weariness of job and position in life? Most likely. But what good would sports be if they couldn't change history in the span of twenty four hours? What good would they be if they didn't make you question your own mettle and achievements? What good would they be if they didn't make you think of music? Editors Note: In my last post I was mistaken when I mentioned that The Sanctuaries would be playing at Cake Shop on February 25. The show will actually be on February 23rd, which is a Tuesday. Its not on the calender on the website yet, but trust me its going down. Now, the next installment of From Here to the Last Mound of Dirt. This is the last portion of what is known as "Part I" of the book. The next section features a drastic shift in perspective. Rather than be told from the perspectives of each of the living O'Donnell family members, the next Part is broken up into three larger sections, each told from the third person perspective of a character in relation to the family. The first is the funeral director at the funeral home, the second is the limo driver to the cemetary, and the third are the gravediggers at the cemetary. I will be breaking these sections up and providing them to you at cut-off points I deem appropriate. Please continue to follow me if you have been. There’s dad in bed. I’ve got the lamp on. The lamp that was on mom’s side. They both look the same, the dark green shades. Her magazines are still laying next to her clock. Harpers, New Living, Better Homes & Gardens. A book is draped over the clock, marking the page. It’s Sons and Lovers. D.H. Lawrence. One of those pastoral looking paintings is on the cover, like all the old books they gave us in high school. I look up to the lamp and follow its light over to dads’ shape beneath the covers. He licks his lips. I watch him as I put the glass to his lips. The water tilts and he drinks and there are drips falling to the sheets. I put the water back. I turn down to my knee. I scratch the denim. I look up. His eyes are still closed. His body is stretched out beneath the blanket. It looks like he just fell from the top of a building, spread eagle, right on his back. The light shapes the curves of his body. It makes him look bigger than he ever was. I’ve been bigger than him for years, but he had that thin toughness, that look to him . Everyone used to call it old-man strength, the power that came from within your manhood when you got married and gave birth to a kid, the power of protection. It was supposed to be the same stuff that lions and bears were made of – all males. At least Cicero and Gertz used to say that about coach at practice. About dad too. Licking again. Now his eyes are open. I laugh and I feel something over my shoulder. I feel Eve. I turn and there she is. Leaning in the light from the small hall into their room. I feel her? I can’t think of something to say. I look back at Eve. One hand is under her chin. She loves dad. He closes his eyes. In the dim greenish light it looks like a tear is on his lid. He opens again. His eyes are red. He pulls the blanket down again. I see his legs move a little closer together. I look down again. I reach for the carpet. My vision is watery. The green light makes me feel heavy and clumsy. Now Eve is on my shoulder – her hand. He just closes his eyes. I turn up and her sight is off in space. I look to dad’s lit shape, his dim frame. I push myself up with my knee like I was in a huddle on the wet grass of the field in the morning. I wish I could hear the birds chirp like they did on a Saturday or Sunday. I take Eve’s hand and look at her. I look at her and I know that I love her as we walk around the bed. I keep my grasp on her soft and clammy skin as I turn the lamp on mom’s side off. We’re in the darkness, a few slants coming from the hall. I feel sobriety. I feel the light in Eve’s stomach. I just don’t know what it all means to me as my father sleeps spread eagle in his bed, drunk, dreaming of his wife. It’s a funeral for my mom and his wife. I’ve got a wife who’s about to be a mom. What does that make me?